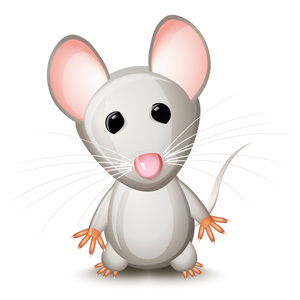 Are You an Academic or a Mouse? Do you scurry around doing what others want or need you to do, putting their priorities first on your agenda? Do you give extra time to those students who want to talk to you for more than their allotted time, or drop whatever you’re doing whenever your email pings? Or perhaps you spend what could be your important writing time playing endless games, surfing websites, on Facebook or downloading apps. Either way, you’re running scared. Too scared to stand up to others and say, “No; I’m busy.” Too scared to face your own fears of writing to say, “I’ll play with this later, after I’ve done 15 or 30 minutes of writing, like Gina says I should. So the time has come to ask yourself: Are you an academic or a mouse? You’re an academic! That’s right, an academic. Yes, I mean all of you! And gosh darn it; you can do what the most productive academics do! But how? Here’s one way of looking at how you manage your time that may help. In my presentation to the AAS, I spoke about Stephen Covey’s Time Management Matrix. As I thought about what to focus on in this newsletter, I realized that I had never written about it to you, my favorite people! Perhaps you’ve heard of Stephen Covey through his most well known book: The Seven Habits of Highly Effective People. The Time Management Matrix illustrates the basic principle of another one of his books, First Things First. Covey created this matrix to illustrate how we don’t focus on what really matters to us in our lives. 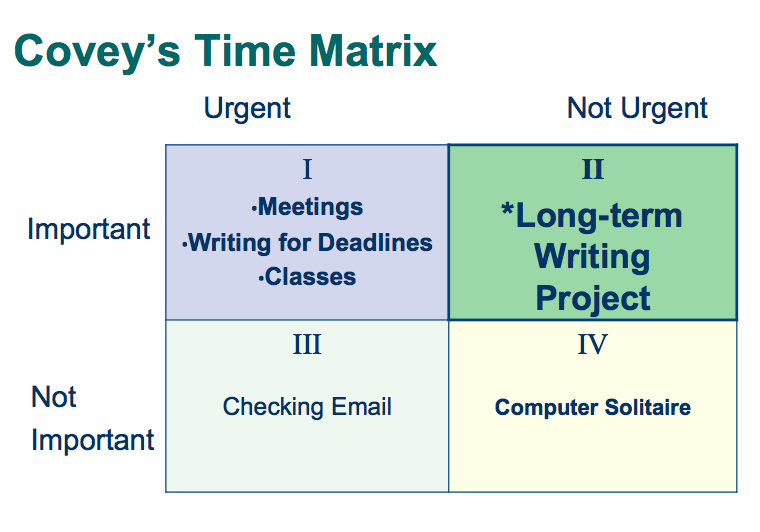 In this Time Matrix the x (horizontal) axis is divided between Urgent and Not Urgent tasks. The y or vertical axis is divided into Important and Not Important tasks. This creates four Quadrants. Let’s take a counterclockwise trip around the Matrix. The Urgent and Important Tasks of Quadrant 1 are those that you really must do in order to stay in school or keep your job. For example, you wouldn’t consider not showing up for a class you were teaching because you weren’t in the mood. Quadrant 1 tasks are all “ruled” by other people. The deadline tasks have deadlines imposed by others. You must show up at important meetings. People who like to feel busy and to feel that they are accomplishing a lot may spend more time than they need in Quadrant 1. And indeed, they may accomplish a lot. But are they accomplishing those things that will advance their career, or meet their life goals? On the other hand, no one would argue that you could skip the tasks in Quadrant 1 on a regular basis. So how do you deal with these urgent and important tasks? To manage the amount of time you spend on Quadrant 1 tasks, you must evaluate periodically whether you are doing too good a job either in quality (e.g. overpreparing for classes), or doing too many of these types of activities (e.g. volunteering for too many committees) for your own long-term­good. Continuing counterclockwise, we run into Quadrant 3. Here are tasks that seem deceptively urgent, but which are not. That would include some email (an astronomy professor pointed out to me that some email is very urgent and important and would go in Quadrant 1). But email from a friend doesn’t have to be answered right that minute. It may feel urgent in the sense that the friend would love to hear from you, but it’s not that important to answer immediately. You can get to it eventually. Many interruptions are like that. They make you feel that you must jump up and respond to them immediately; but in fact, you have a choice. To manage the amount of time you spend on Quadrant 2 tasks, you must stop; then look both ways before crossing. Analyze whether you really need to attend to the task immediately. Perhaps you can instead deal with it by adding it to your to-do list (I’m loving Toodledo at the moment), along with a priority rating and a get-it-done-by date, if you’re into that level of detail. What do Quadrants 1 and 3 Have in Common? What these two left hand quadrants have in common is that the activities involved usually are those that fulfill other people’s agendas. If you spend most of your time in these quadrants, then you are not giving the importance that you should to career and life-enhancing activities. This is where your brain wants to go when it needs rest. Which is a great idea! I think it’s important to take mini-breaks throughout the day, which are planned and without guilt. So play computer solitaire, or watch “The Biggest Loser” when you get home. Of course, you don’t want to use this kind of activity as a way of procrastinating doing something important. To manage the amount of time you spend on Quadrant 4 activities, use them as rewards for doing the activities in Quadrant 2, or secondarily for the draining activities in Quadrant 1. Don’t do them first; do them once you have accomplished what you’ve planned to accomplish. You can even set a timer that will go off and remind you that it’s time to stop your relaxing task and get back to the work that matters. Our counterclockwise journey around the Time Matrix brings us to the all-important, but underutilized Quadrant 2. Here we find the dissertation, the article, the book, or (in some cases) the grant proposal. These are the products that usually will make or break your career. These are the fruit of your years of thinking, researching and writing. They represent YOU, and will carry you to the next stage of your chosen career. But they have no deadlines and are not urgent. At least not today. Or tomorrow. Only you will suffer if you don’t work on them. Sadly, all academics know this at some level. So if they are not working enough on Quadrant 2 activities, they feel guilty, inadequate, anxious or even depressed. Then follow all the advice that I give you in these newsletters and on my website! Make it a daily habit to accomplish a relatively short period of writing/editing/revising your IMPORTANT BUT NOT URGENT writing projects – even 15 to 30 minutes. Use a timer and stop and start when it alerts you. Don’t binge write. Schedule easier tasks (reading, finding citations) later in the day or during your tired periods. It all comes down to awareness and will power, and in many cases, courage. The courage to say “No,” or “No, not now.” The courage to face your anxieties about writing and just do it. And the courage to look at what you want from your career and your life in the long run, and then have the character to act on that knowledge. As we established at the beginning of this article, you’re not a mouse! You’re an academic, and you can accomplish these goals. It just takes some awareness, some will power and some courage. And maybe some cheese. Previous post: Write or Rest During Your break? Here’s a Plan! Next post: Is it possible to be an academic and a parent?